384p. Flatiron. Feb. 2019. Tr $26.99. ISBN 9781250175458. 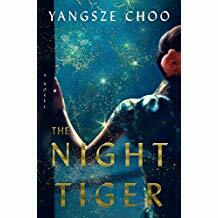 In 1930s colonial Malaya, Ji Lin wants to attend university but instead apprentices to a dressmaker and secretly moonlights in a dance hall to help pay off her mother's gambling debts. When a dance partner drops a preserved finger and then turns up dead, complications Ji Lin never could have imagined arise. After Dr. MacFarlane dies, his young houseboy, Ren, is sent to work for a different British doctor, but Ren has his own agenda—find MacFarlane's long-missing finger and bury it in his grave before the end of the traditional 49-day mourning period. The book alternates between Ji Lin's and Ren's perspectives, and their story lines become tangled in unexpected ways long before the characters meet. A string of bodies spells misfortune as a possibly supernatural tiger stalks the characters, and dreams contain messages from the beyond. The final, stunning reveal only succeeds owing to masterly plotting. Steeped in Malayan and Chinese folklore, Choo's opulent writing and world-building deftly work in context and explanation, and the back matter contains further information. VERDICT Weaving family obligations and colonialism with were-tigers and ghosts, this novel is compelling and mesmerizing. That rare literary work that will appeal widely.